Derby's waste - a rubbish blog ! : Something is rotten in the brown bin! Something is rotten in the brown bin! A LOOK BACK AT THE DECISION TO BRING IN A CHARGE FOR GARDEN WASTE IN DERBY UK. FIRST WRITTEN AT THE TIME THE PROPOSAL WAS PUT IN PLACE BUT NOW INCLUDES UPDATES. Derby told DEFRA they had in use 89,215 brown bins in 2012/13. It isn’t clear if that includes homes who had a 2nd brown bin. 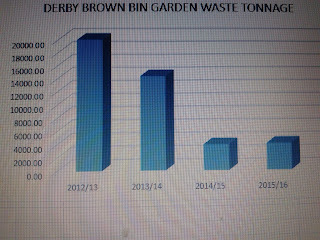 Council accountants confirmed to me that in 2012/13 19975.11 tonnes of waste was handled via the brown bin at a cost of £49.13 per tonne – As confirmed by Russell Sexton at Derby City Council. If these figures are correct that produces a cost per household in the last financial year to the council of £20.86 for a full year including food waste which clearly isn’t £40 without food waste for a part year. That waste in general has to be collected whatever bin lorry collects it – once in the RRS / SHANKS residual waste contract that waste would cost at least £100 per tonne to handle – ie circa £1,997,500 WITHOUT THE COLLECTION COST. 2015/16 costs were at least £107.40 per tonne and at a recent Full Council meeting it was quoted as £120.00 in 2016/17. An FOI request was made for all documents relating to the brown bin £40 charge proposal. Documents show the council expected a 10% fall in recycling – based on the 2012/13 recycling rate of 45% will mean a plunge from 48% in 2010/11 to 35% in the future. The image below shows the fall in garden waste composting via the brown bin - prior to the service termination this material included a percentage of food waste composted via the brown bin service. The documents sourced via FOI show a planned charge of £20 per bin with £10 for the 2nd bin, this does not reflect the now applied £40 and £20 for the 2nd bin charge. The final options appraisal further noted a charge of £20 and £10 noting this is relatively low compared to other councils. It notes that the city will FAIL to reach the 2020 government target of recycling 50% of waste. The council had planned to move recycling to the black bin and residual waste to the small blue bin. The council was aiming for a 20 - 30% uptake in the chargeable garden waste collection. The blue bin supplied to residents has a capacity of 140 LTR which is relatively small and does not have the capacity to contain all of the recycling material currently presented at the kerbside. It is therefore proposed that the blue bin is swapped over with the black bin. The black 240 LTR bin will be used as the recycling bin and the blue bin will be used for the residual waste. A weekly residual waste collection service will be rolled out citywide. A charging policy for the collection of garden waste is proposed which may prove unpopular with customers; however 30% of Local Authorities already charge with others coming on stream. This option will produce savings of £1.14m and will streamline our service delivery with the implementation of a single pass collection system for dry recyclables. This will prove very popular with our customers as they will no longer have to use red, orange and blue sacks. A weekly residual waste collection service will also prove very popular. option 6 is not what actually happened. The reality was that while the brown bin itself stayed the same, new larger blue bins were issued and small blue bins were removed. Dry recycling stayed in the blue bin and residual waste in the black bin. FOI data showing a cost break down suddenly shows a £40 plus £20 charge for bin number 2 or more. No FOI papers show why this figure changed from the planned £20 and £10 charge. The council in the FOI data consider that 20,000 residents would sign up for the £40 charge with 1 in 4 of those agreeing to pay a further £20 for a 2nd bin. IN 2015 CUSTOMERS FOR THE BROWN BIN SCHEME STOOD AT 12,083 AND NOT THE 20,000 CUSTOMERS THE COUNCIL EXPECTED. It is quite clear that garden and food waste was being processed far cheaper than the charge proposed and later applied and the vastly higher rate if it moves as it has done to the black bin residual route. The charge is shown in council papers to be lower than that now applied. Large volumes of waste will now be diverted from recycling and composting driving down the cities recycling rate and diverting waste to landfill and incineration and will likely be fly tipped. They have managed to select a waste option that was not even in the options considered. THERE IS SOMETHING ROTTEN AND IT IS NOT JUST WHAT IS PUT IN THE BROWN BIN!